For purposes of this discussion, we will be focusing on the needs of home-based landlords (not professional companies). The small landlord has been given limited options over the years to obtain tenant credit reports. This is due to the requirements set forth by the major credit bureaus, but now individual landlords have two options to obtain credit reports based on official credit data (as opposed to questionable private sources). Option 1: Tenant released credit report. This involves the tenant giving a specific authorization to the credit bureau to release the report directly to the landlord. How does it work? : A landlord must sign up and submit a request through RealSerious.com with the tenant’s email address. An email is then sent to the tenant asking him or her to verify the request and approve the release. 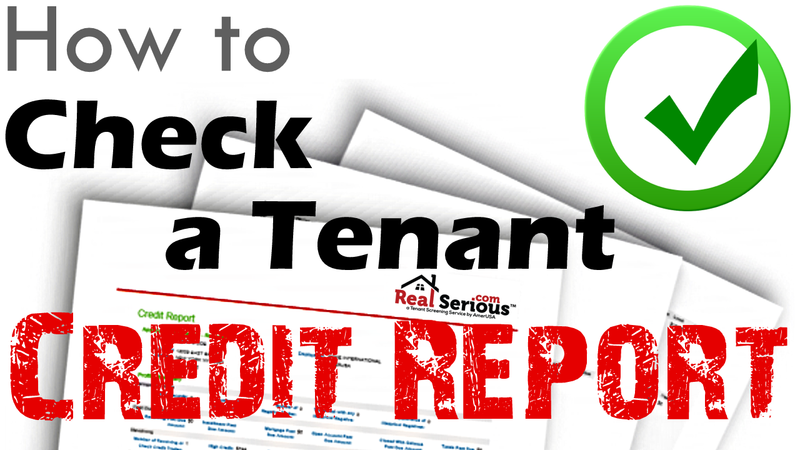 Report Format: The tenant released report is an official credit report with the bureau’s credit score that has its account numbers, and a few other identifying pieces of information, removed to protect the tenant’s privacy. Option 2: Landlord requested credit report. This report is requested from the credit bureau by the landlord directly after the tenant’s authorization has already been obtained (usually a rental application). How does it work? : After obtaining a signed rental application from the tenant, the landlord must sign up at AmerUSA.com and submit a request. The results are then returned within just a few seconds. Report Format: The landlord requested report is also an official credit report with a FICO credit score range that has its account numbers, and a few other pieces of information, removed to protect the tenant’s privacy. What about membership fees? : There are no fees required for registering or having either account. You only pay for each tenant that needs to be screened. Both options are intended for home-based landlords. If you need to obtain instant access to unrestricted credit reports, you must apply for a professional account and pass an onsite inspection of your office.